B-411 1/4" B-411 1/16" B-412 1/4" B-412 1/16"
B-414 1/4" B-414 1/16" B-416 1/4" B-416 1/16"
B-418 1/4" B-418 1/16" B-421 1/4" B-421 1/16"
B-422 1/4" B-422 1/16 B-423 1/4" B-423 1/16"
B-424 1/4" B-424 1/16" B-425 1/4" B-425 1/16"
B-427 1/4" B-427 1/16" B-428 1/4" B-428 1/16"
Decorative Flake Flooring, or as it is also known Decorative Mosaic Flooring Systems, use a vinyl flake sandwiched between a base coat of wet resin and at least one clear topcoat. 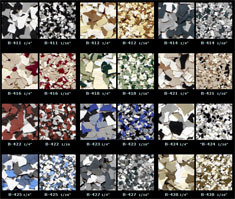 This system provides an excellent alternative to a solid colored floor offering a multicolored decorative appearance. With thousands of color combinations and several sizes to choose from the options vary wildly. The resulting patterned floor also works well to hide dirt and can provide an easy to clean smooth finish or a orange peel floor finish depending on the installation. There are two primary trade offs in color selection between light reflectivity and the ability to hide dirt and wear. 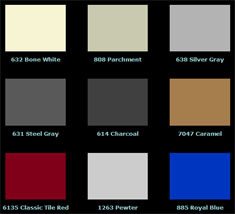 The first consideration in selecting a flooring color is expected abuse and cleaning schedule. If a floor is going to be exposed to heavy abuse and a dirty environment and/or lack regular cleaning, a darker colored floor will better hide dirt and disguise wear. If on the other hand a clean environment is desired, a lighter colored floor will show dirt better highlighting areas in need of cleaning. The lighter the color the more light a resinous floor will reflect thus increasing the ambient light allowing for reduced lighting and/or a better lit area. 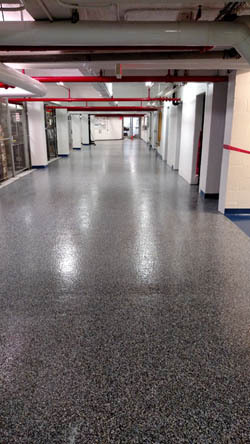 A high gloss, light gray coating will roughly double the ambient light over an uncoated concrete floor. The downside is in general the lighter the floor the more apparent dirt and wear are on the surface. These effects are even greater on a white floor.